I always plan one or two very long practice rides in the lead up to a big endurance event. This year my plan was to ride from Milton Keynes to the Brighton Seafront – and back again – as my longest training ride. I’d been building up to it with great anticipation, but on the eventual day it didn’t quite fall into place with the fervour I’d hoped for. I had got up at 7am on Saturday 24th May 2014 in a hotel in Great Yarmouth, where I had put up overnight with the children in order to work at the parkrun event taking place from 9am that morning. I’d had 5 hours of sleep (because we’d arrived in the early morning hours). I knew I would be riding to Brighton from Milton Keynes later in the day, so I had fuelled up on a big Full English breakfast at 8am, as well as a large bowl of assorted breakfast cereals. We drove back to Milton Keynes in the afternoon and immediately went to attend a party the children were invited to. 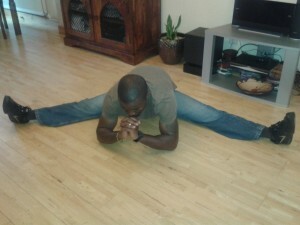 After the party I’d got back home and started preparing for my ride. 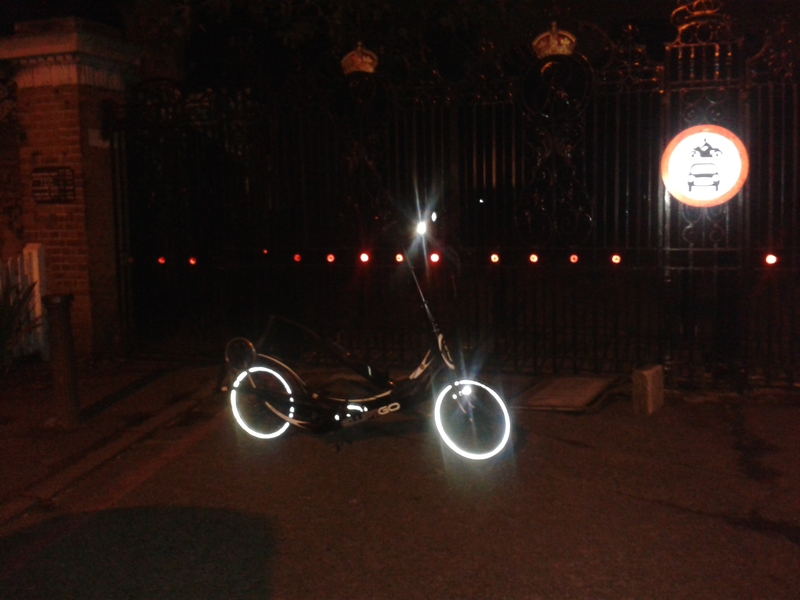 I had pumped the hard-wearing Schwalbe Marathon Plus tyres to the maximum 95 psi for easy rolling, attached my headlight, fitted new batteries to the tail-light, and stuck a new grip surface to the foot platforms of the newly-serviced 11R ElliptiGO. 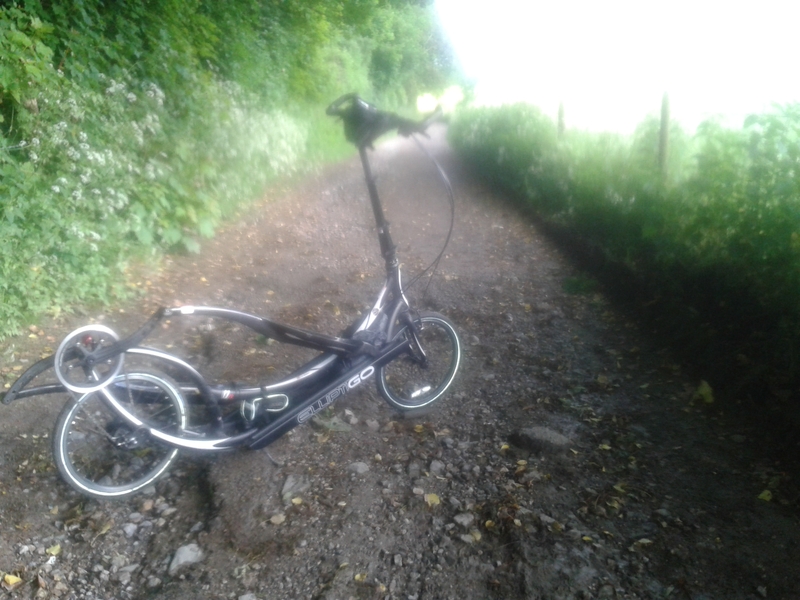 I had not ridden my 11R ElliptiGO from the time I’d got off at the end of the London Edinburgh London (LEL) 2013 Audax ride, but I was counting on everything working perfectly after some painstaking repair and service work. In my backpack I had two spare inner tubes, an extra 750ml water bottle as backup, in case my 3 litre backpack bladder ran out in the middle of nowhere, some spare load wheels (in case I got a huge stone jammed in the roller mechanism on some of the bad roads I expected to encounter), some paracetamol tablets (in case some sort of pain or discomfort arose), my bottle of caffeinated salt tablets (electrolyte replacement) and my bottle of 200mg caffeine tablets (stimulants). 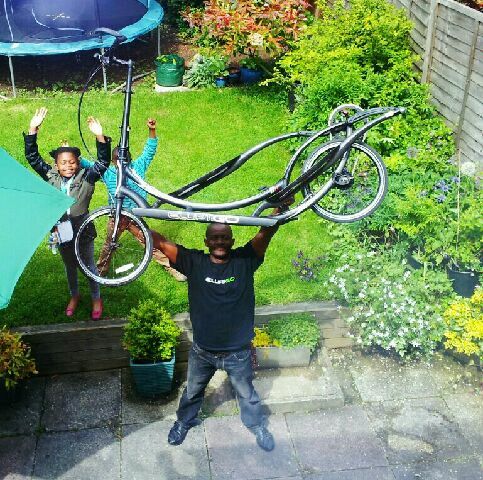 The ElliptiGO lower frame tray was laden with my spare all-weather cycling jacket (wrapped in a bin liner for waterproofing) and my bike tool-kit. The handlebar bag had two pairs of sunglasses (clear and dark ones – for day and night usage), my phone backup battery charger, my phone (for security and GPS routing), my waterproof SaltStick salt tablet dispenser and my GPS to measure progress. That’s all I was taking with me. Ivy, the kids and I had all embraced and said a short prayer before I had departed at 5:58pm – and my sweet little 9 year old daughter broke into tears, which had broken my heart and crushed my already low spirits before the ride had even started. Luckily she’d been in high spirits when I phoned later in the evening to say goodnight so that had released me from the guilt and allowed me to concentrate more closely on the task at hand. 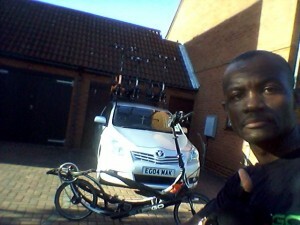 There was a steady but bearable headwind blowing from the south and it would persist all the way to Brighton. When I had started off I had spent the first 20-miles getting to grips with the 11-gear system, after exclusively using an 8-speed ElliptiGO for the past 10 months. The 11R bike had felt brand new – it was smooth and it was noticeably lighter than the 8C bike I’d been using in my training. The gear shift was impeccably smooth and accurate, but I had taken a few hours to truly adapt to the gear trigger switches (which work in the opposite directions to those on the 8-speed). It had rained twice in the first 3 hours and I’d been soaked through, but I would dry up within 10 minutes of the storms ending so no significant discomfort was caused by the rain. The only drawback I did suffer due to the rain was that the new grip-strips I’d stuck to the foot platforms an hour before leaving had soon come loose and then came off within the first 40-miles of riding – meaning my feet were able to move around on the platforms because I didn’t have toe cages on the bike to hold them in place. In fairness, I did not prepare the foot platform surface correctly before sticking them on – but if it hadn’t rained I don’t think they’d have come off. The roads were very busy that Saturday evening, which had surprised me. My main aims in this ride were to verify my long distance pace (in advance of the Mille Cymru Audax), to practice riding for 24 hours (to make sure I was well organised and could anticipate standard ride management issues), and to establish that it was possible to ride for 24 hours without eating – to cut out the need for food stops on the Mille Cymru Audax. The Mille Cymru course is 40% hillier than the LEL 2013 course, with a higher pace requirement (and less stopping is the only realistic way for me to speed up on such a difficult course). In training I’d regularly ridden for up to 140-miles whilst fasting and I was confident I could do 24 hours without any trouble – but it still needed to be formally verified. My early pace was 11 mph and it felt comfortable. The course was gently undulating for the first 80-miles, but the headwind had not subsided throughout the night. I had gone from Milton Keynes to Hemel Hempstead, then on to the North London suburbs of Harrow, Ealing, Kew and Richmond. The gates to Richmond Park were locked but I had met a young local guy walking home that night who’d shown me a special ‘caged gate’ system at the sides of the park entrance, which is very hard to discern if you’re not told about it. He’d said all the entrances have them and I could get in and out using them. Night fell around 9pm and I had quite enjoyed the first part of the ride – until I had crossed into South London and Surrey. Going through Richmond Park I’d been a little nervous of the huge deer herds and I could see their dim shapes moving in the darkness. Some of the smaller ones had looked grey and the larger ones were darker in colour. There were dozens of deer in huge herds and they would run wildly when they saw me approaching. Often they would cross right in front of me and the herds would split up as I came through – some of the animals hesitant to cross the cycling path in front of me – then they’d suddenly break into a stampede at the last moment in order to join the ones that had already crossed. I knew they wouldn’t attack, but I had feared one might collide with me by accident. Thankfully I got through without any trouble. Heading South into Surrey was the most disappointing section of the ride. I was using sidewalk cycling lanes most of the time and my pace rolling had fallen from 11 mph to 9 mph. The streets were very busy with cars and people, but I had felt really safe with a curb between me and the cars. I did have to keep re-routing whenever the GPS would lead me to dead end roads where the designated cycling path was just a muddy, stony footpath through a pitch-black forest. The vegetation would often be so low-hung that even if I had been stupid enough to try these routes I’d have been too high riding on an ElliptiGO. The phone GPS programme had let me down a few times by the time I had reached Surrey. When in “bike-mode” it takes you along quiet B-roads and also tries as much as possible to follow the National Cycling Network designated ‘cycling routes’ – most of which are unsuitable for anything but a full suspension mountain bike. I had long grown to despise the National Cycling Network after months of getting stuck on off-road courses when following the GPS guidance during training and I had learned to ignore instructions to go down no-through roads that led to these ‘cycling paths’. The biggest problem with the GPS bike-mode was the insistence on following canal sidewalks – most of which are just bumpy, muddy paths. The Grand Union Canal passes through Milton Keynes so whichever direction I ride in, the GPS tries to take me to the Grand Union Canal – which is one of the designated cycle routes in the National Cycling Network. Going to Brighton I had figured I’d stick to usable routes which I had a vague idea of and I let the GPS catch onto those routes and lead me through the bits I was unsure of. But to do this I would often have to use “motor vehicle mode” on the GPS to avoid unpassable routes. But that still required caution because some of the motor vehicle routes would go down busy dual carriageways, so I had needed to keep returning to bike-mode to stay on safe roads. The best part of the night trip was stopping at petrol stations to refill my water. The attendants were always as pleased as I was to meet another friendly human being in the middle of the night and have a chat. I had enjoyed chatting with them all. From Reigate (in Surrey) I’d found better roads and had picked up my rolling average pace until it had levelled at 11mph again – but the routing issues had started again around 80-miles in, when I had found myself on dual carriageways where cars were cruising at 70-mph. Most of them had bumpy tarmac cycling lanes running alongside (note to all UK cyclists – most major A-Roads do have a thin cycling lane running beside the road, behind the barriers). Sadly, whilst carrying the bike over one set of barriers, I had seemed to mildly twist my knee, around 85-miles into the ride. About half an hour later sharp shooting pains had developed around the sides of my left knee, as a result. 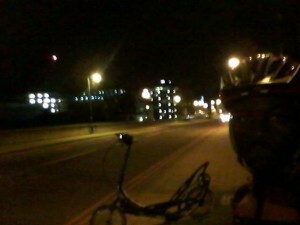 It was now around 4am and my mind was at its lowest, as tends to happen with long overnight rides. I knew this low point was going to happen but when it did I couldn’t recognise it actually taking place. I had thought I would have to abort the ride with the sudden knee pain starting up at random intervals from time to time, sometimes for no real reason at all. The knee would actually feel better on the uphill sections and would get worse on downhill stretches, if my cadence got too high. I became so frustrated with the knee pain that I had almost burst into tears at the thought of having to quit the ride when I was almost halfway through (and I was feeling fantastic, from a fitness perspective). When the pain would stop I’d become really anxious that it would return again, it was almost like I was having a mild panic-attack. It had occurred to me that perhaps the caffeine doses could have been getting to me, but in retrospect I think it was just the standard long-distance cyclist low-point caused by body-clock issues. I always have a low point between 3am and 6am on 24 hour rides and I never anticipate it (probably because these rides are so infrequent for me that it’s hard to get used to them). All this took place between 3am and 6am – and then the knee issue had mysteriously disappeared and my spirits had lifted. 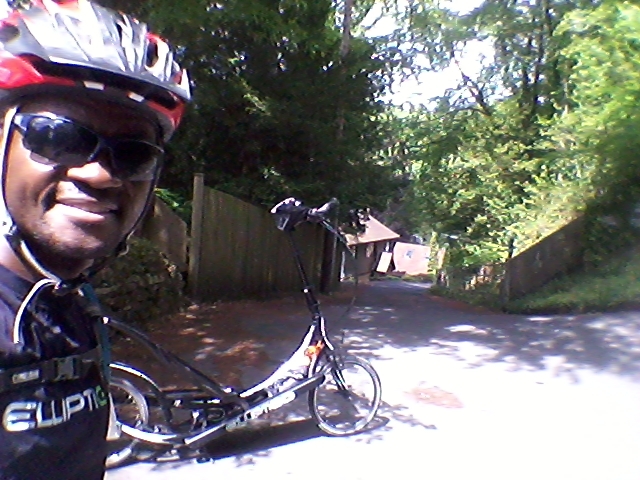 The final 30-miles towards Brighton were extremely hilly – much hillier than I had expected. I was on National Cycling Network Route 20 – and that particular cycle route was actually ride-able (all paved or tarred) but very undulating. It ran mostly alongside the dual carriageway leading into Brighton and would deviate into the hills and forests from time to time. For a lot of the Route 20 section cars were coming towards me at motorway cruising speeds on the dual carriageway – because the cycle lane was on the side of the carriageway facing the traffic heading in the London direction, away from Brighton – but with a motorway safety barrier between us there was no real reason for concern. I often had to use the lowest gear ratio on the 11-speed on some of the steeper lanes in this section. 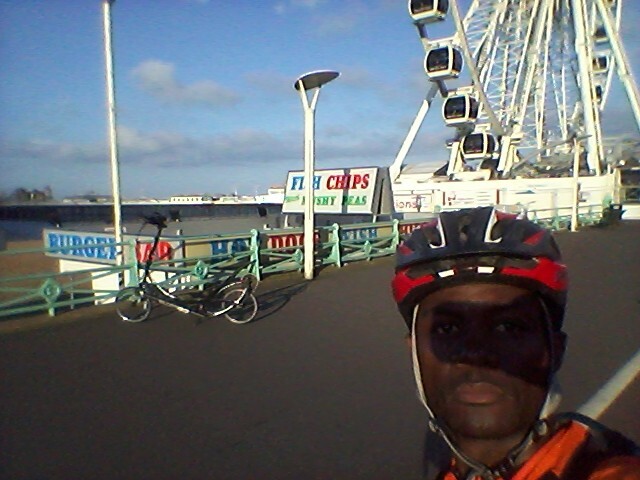 When I had finally reached the Brighton seaside there were quite a few cyclists about (at around 6:30 am) – probably trying to use the seafront lanes when there still weren’t any seaside crowds. 12 hours and 25 minutes had passed since I’d set off. There were also lots of ‘night clubbers’ around – still enjoying a ‘night out’ – and I could hear the music blasting out of one of the seafront nightclubs. 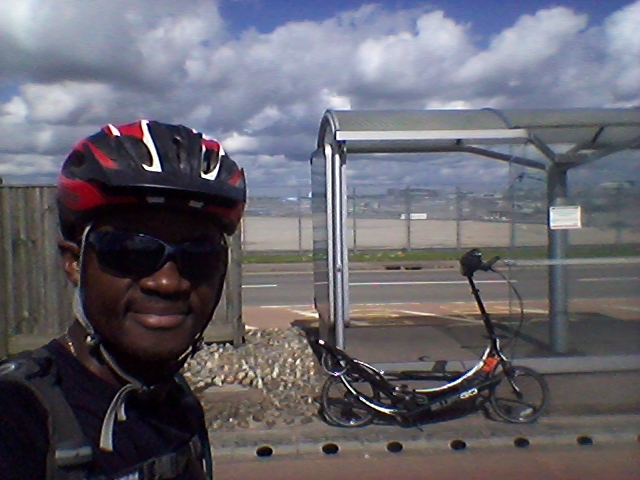 The way out of Brighton was a challenge because I did not want to retrace National Cycling Network Route 20. The alternative GPS cycle routes were unpassable and on ‘vehicle mode’ the routes chosen were too dangerous for cyclists. I had spent a good hour trying to get out of Brighton until I’d met a local dog walker who’d explained how to get onto the private road on the Ditchling Beacon climb and get onto the London to Brighton Bike Ride course. Ditchling Beacon was steep on the private road, with sharp speed humps, but not as tough as the other side used by the London to Brighton bike ride course. I’d met lots of cyclists on the Ditchling climb – one of whom was trying to get a Strava personal best for descending and ascending Ditchling Beacon. On the descent I was surprisingly faster than him because the low centre of gravity on the ElliptiGO means it actually handles better than a road bike. But I had slowed down to stick with him because he could explain the best route back to London. His instructions were perfect and were easy to follow. But the route he gave me was very hilly. See how steep it was from that house below? This was a frequent occurrence in Surrey. I recall some incredible climbs where I had to drop to the lowest gear for long stretches. Particularly hilly were Reigate Hill, Borde Hill and some of the areas around the Epsom Downs. I was not tiring but the hills were just very steep and this was reducing my average pace significantly. I could not understand how riding from Brighton to London could be so hilly – having done the London to Brighton Bike ride twice and encountered very little serious climbing. But it was genuine and I was eventually rewarded with a 30-minute downhill stretch – all the way to Central London (that was half an hour at speeds of 25 mph and higher)! The highest speed reached was 53 kph (I’d set the odometer measurements in km for easier map reading during the Mille Cymru Audax). Central London was a pleasure to ride on a bright Sunday morning – although it was so busy you’d think it was a Saturday morning. Every business was open, even the car mechanics. I had used Super Cycle Highway Number 7 (CS7) which was quick and allowed for swift progress. It was quite pleasant in the sunshine, with lots of commuters and sports cyclists to chat to – and no more hills! I had noticed how slow my long-distance pace is, because most of the commuters were pulling away from me quite rapidly at the traffic lights. My average rolling pace was still a steady 11mph (it had gone back up after that 30-minute downhill stretch), so I wasn’t actually slowing down physically. My phone GPS backup battery had run out just as I had reached Battersea, so I now know it lasts about 20 hours in full satellite navigation mode. As soon as I had reached Edgware road (at Hyde Park) I’d switched off the phone GPS function to save the battery power of the phone itself, because I knew the way back home from memory. The trip had become faster from that point because I no longer had to stop to mess about with the phone GPS settings and the roads were much flatter as well. One needs to plan toilet breaks carefully in the big city, but everyone was friendly and the guys in one of the Turkish restaurants had looked after my bike and let me use their basement toilet as I had prepared to leave Central London. Home again – at last!!! Once on the A5 (Edgware Road) I’d picked up the pace and was still feeling very strong. I was breathing through my nose, which I don’t do while training over shorter distances (because short distance pace would be too hard for that), but on the long-haul I use a lower intensity and nasal breathing. I had noticed my lips were still sealed even when I had taken the pace up to 13 mph average – I wasn’t really feeling the strain at all even after 20 hours of riding. The prevailing tailwind had allowed for an average pace of about 13 mph from the edge of North London all the way to Milton Keynes. Exactly 24 hrs into the ride I had covered just 358 km (224-miles) and had ended the ride with 376 km on the odometer (that’s a total of 237-miles, in just under 25 hours). With a rolling average pace of 11.5 mph (whilst on the move) that tells you just how many times I had stopped to reset the GPS. You can see the GPS recordings of the first 257km before my GPS battery ran out, on this link. I didn’t have any formal riding breaks at all – except to go to the toilet or type online update messages (a maximum of 5-minutes at a time, every couple of hours) – so the 3 hours plus of stationary time were mainly used to reroute the GPS (which would take about 3 minutes each time). Sometimes I had stopped to reset the GPS at 10 minute intervals – for hours on end. It all adds up – and that will be the enduring memory and disappointment from this ride. So what had I learned? Don’t forget to take a back-up headlight – I only had one light mounted on the bike in my haste to get out by 6pm and if it had malfunctioned the ride would have ended. I need to find a way to lighten my backpack – my shoulders were very sore on the following day (and quite strained during the ride itself – especially on the areas of my trapezius muscles where the straps were positioned). I had experienced this effect on the first day of LEL 2013 due to the heavy backpack I’d carried in that event, but the sensation had subsided on subsequent days as I had got used to it. In this latest ride I had a 3-litre water bladder (3kg when full) and a back-up 750 ml water bottle (almost 1kg), plus my supplement bottles, tools, spare parts and inner tubes. If you follow intermittent fasting like I do it’s straight-forward being able to condition yourself to ride comfortably for 24 hours without eating any food – and without any loss of performance. I could have kept on going indefinitely at the pace I was riding – but it is essential to take salt supplements when doing this type of ride fasting – in order to remove any risk of “water poisoning” (a potentially fatal syndrome caused by over-dilution of the blood due to the electrolyte loss – caused by sweating lots whilst also drinking lots of water to prevent dehydration). Riding without eating is actually more comfortable than eating every hour – for 24 hours of riding – when you have learned to correctly condition yourself to do this through intermittent fasting. It’s possible to remain awake and alert for 36 hours – if needed. I had been awake for over 36 hours at the end of the ride and was able to easily respond to my alarm 3.5 hours after I went to bed, an experiment I’d done to see how fatigued I’d feel after sleeping for just 3.5 hours at the end of a long riding stint. If my pace is not fast enough I will consider riding non-stop for the first half of the Mille Cymru Audax, in order to meet the 75 hour time limit. I should always use toe cages on long rides on the ElliptiGO – I had removed them in order to prevent myself from riding too fast, but after I had slipped whilst climbing that roadside barrier I had found that trying to keep my feet in the right place on the foot platform may have been aggravating the knee injury (which had developed when I’d slipped trying to carry the bike over a barrier). A lot of it is in the mind. By this I mean that to do well in ultra-endurance events one has to be really focussed and motivated. Mental conditioning is essential. If you can’t find ways to lift your spirits during long rides you will also fail to lift your performance on those long rides. My pacing and strength had pretty much matched my moods throughout this session. I am definitely going to spend the rest of my build-up to the Mille Cymru Audax working on my mental strategies and increasing my self-belief. This ride has shown me that the Mille Cymru ride will be a tough one to complete – and even tougher to complete within the time-limits – but this ride had more elevation gain in the first 256km than either of the first two ‘stages’ of the Mille Cymru course – according the the GPS recordings. I have not completely decided on my riding plan and will require further feedback from the Chiltern 100 Sportive training ride next weekend to truly understand my abilities on hill climbs. I will also need a better understanding of what it will be like riding such a hilly course with Alan and Stu – who are both about 15 kilos lighter in bodyweight than I am (meaning I will be expending about 20% more effort than them if we go up hills at the same pace). Perceived exertion differs from basic heart rate monitoring, because how you feel does not always correspond to your heart rate and how hard your heart is working on a ride of this distance. On this ride my average heart rate was 124 bpm and the maximum heart rate was apparently 176 bpm. I’d never have allowed 176 bpm if I was actively monitoring my heart rate, it is the highest I’ve ever recorded (my previous highest recording was 172 bpm during a hill interval session two weeks ago) but during this ride I had never felt like I was exerting too hard for it to be sustainable (regardless of what the recordings have revealed). Sometimes a high effort level just ‘feels’ right – it’s about learning to understand your limits in a long ride through knowing your body and using intuitive pacing. I must find effective ways to avoid stopping frequently – or for lengthy periods. Success in the Mille Cymru event will come down to minimising stops. That means being well organised and having tested everything in advance. Good preparation saves time during the ride.